Jennifer Keesmaat says if elected mayor, she would implement mandatory community benefit agreements for city developments that could lead to the creation of 12,000 jobs. John Tory says that's already a priority for him. Jennifer Keesmaat says if elected mayor, she would implement mandatory community benefit agreements for city developments that could lead to the creation of 12,000 jobs. Hours later John Tory, who is seeking a second term as mayor, announced a plan to hire local tech companies to revamp the city's website — with the goal of creating one site where people can pay taxes and bills while tracking 311 requests. He also said signing community benefit agreements is already a priority of his, brushing off Keesmaat's criticism that he hasn't been a strong enough leader when it comes to ensuring city hall hires local. 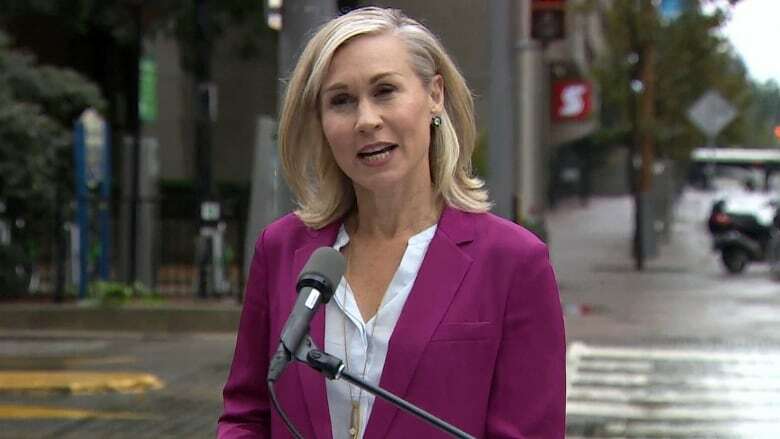 Keesmaat announced her plan on Tuesday at Queen's Quay and Bay Street, where the city plans to build the East Bayfront LRT line. With $25 billion in city capital projects, like the LRT, in the works, the city must ensure it's using workers from the area, Keesmaat said. "We have no shortage of projects underway," Keesmaat told reporters. "We can ensure that our young people are part of this dynamic building boom." Keesmaat said the agreements could play a key role in keeping Toronto affordable, and ensuring there's a strong middle class in the city. Without "a city that's more fair and more affordable," she said, Toronto risks losing its competitive advantage. The announcement quickly won the backing of the Toronto and York Region Labour Council. Keesmaat added she'll encourage private developers to enter into community benefit agreements (CBAs), and noted they've been successful in American cities like Boston and Los Angeles. There are also examples of CBAs in Toronto, including those signed during the expansion of the Woodbine casino and the construction of the $5 billion-plus Eglinton Crosstown LRT. However, Keesmaat criticized Tory, who is seeking re-election, for not pushing for the signing of more CBAs. "Why isn't the city taking the lead?" she said. "We need to put a stake in the ground and say 'no way, we're doing things differently.'" Tory dismissed that, noting the Woodbine CBA was signed during his term on council. He said where there are major developments, Toronto "should have and must have" community benefits to go along with them. 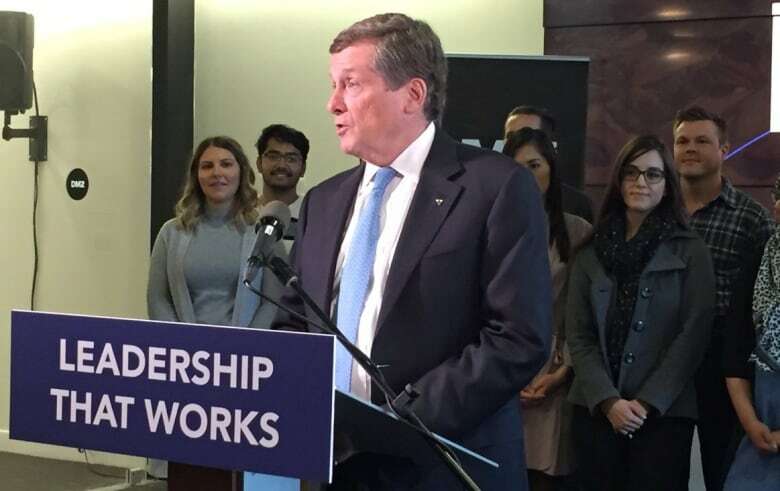 During his announcement at Ryerson University's DMZ — an accelerator for tech startups — Tory also revealed a plan that would see city money support local companies. Tory said he wants the city to create a "one-window online service," similar to online banking, that people can use to interact with city services. Who would be behind that technology? Startups and other companies born in the city. "We have to make sure that every part of our city benefits from our growing tech sector," Tory said. Tory said the city has had some success with things like the Green P app, but has a long way to go. He also noted it's not always possible to hire local, due to procurement agreements that are in place, but said there can be a "modest" preference for Toronto companies.